snowdeal.org > ex machina: the eric update - day 479: another developmental assessment. the eric update - day 479: another developmental assessment. as i've often lamented, it's nearly impossible for parents to objectively judge whether this or that behavior is "normal" within the natural variation that exists with infants and what needs to be actively "managed", given the micropeemie odds for "invisible" disabilities, so it's important to periodically have a professional gauge how odin is progressing in terms of his communication, socialization and motor development. which is why we were visited today by a very nice woman who works for our local "early intervention" program so she could help us determine how he's been developing since her last visit 274 days ago which was as positive as assessment as we could have possibly hoped for. it's difficult to not get nervous before the assessment as you worry whether or not your child is going to "cooperate", but - for the most part - odin enjoyed showing off for her by standing unassisted and even occasionally occasionally taking a few steps, reading ( at this point she's not so concerned about the book being upside down :-) ) and generally having a grand time being the center of attention. 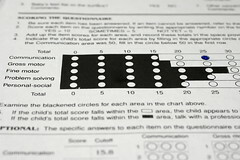 in addition to observing him play, the assessment required us to answer a fairly involved set of questions from the relatively standard ages & stages questionnaire to help quantify his abilities compared to his age adjusted cohorts ( on online version of the test can be found here ). when you sum the scores you'd ideally like to see nothing "in the black", which means - generally speaking - that odin is still very much a boy like any other ( at least any other 12 month old :-) )! buuuuuuuuut, he's showing perhaps ( and i stress perhaps ) the early signs of needing help with language and communication. while he's been saying "dada" since my birthday and even very occasionally "mamma" he doesn't often show strong signs of associating them with us specifically and while have a couple of favorite "proto-words" ( tsh-tsh for "brush teeth", "fsh" for fish, "hh" for "hi" ) he only marginally has the kind of vocabularly you might expect in a 12 month old and we'll want to focus our efforts in the next 3 to 4 months to ensure that he'll have a strong command of 10-15 words that'll be expected of him at that point. there's no need to call in the speech pathologists just yet, but the recommendation is that we should keep a closer eye on his language and communication skills in the coming months to see if any special help is needed. of less importance but which might be interesting to those with kids in similar situation - although he's quite close to walking which is a remarkable achievement for such a wee one, it's still obvious to the professional eye that he's still suffering from the effects of "decreased central tone" which is affecting his balance and coordination. the specialist recommended that we do simple things like loading his walker with heavy objects and occasionally picking up his legs as "walks" on his hands ( think of a human wheelbarrow ) to help him gain muscle strength. but all things considered, it's a relatively minor concern since he's doing fantastically with his other "gross" and "fine" motor skills ( she was quite impressed with his pincher abilities ). and lastly, we learned that the "early on" program sponsors a winter "play group" that's not exclusively for preemie parents but iy does have specialists on the premises who we can talk to if we have any questions or concerns over the winter. it's open to the "unwashed masses" but our specialist said that there's a relatively small number of regular attendees and they're all very conscientious about the the continuum of cautiousness during cold and flu season that might concern parents of micropreemies. so we had a very positive assessment and we found a playgroup for odin! 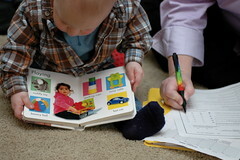 Just wanted to send you a GREAT site for parents of kids at risk for language delays. The info in these books can coach parents on how to create the maximum number of communicative opportunities for their babies. Hope this helps! Wow! Sounds like he's doing great! Playgroups are so fun. My 15 month old loves playing with other kids! anonymous: " Just wanted to send you a GREAT site for parents of kids at risk for language delays. The info in these books can coach parents on how to create the maximum number of communicative opportunities for their babies. Hope this helps!" martha: "Random thought... there is a radio flyer walker recall right now. " gah. i keep forgetting to remind people about recall. we've known for months but it never hurts to keep reminding them. the unit itself isn't faulty per se, it's just the little plastic clickers that make the wheels click. they're easily removed while you wait for the replacement clickers. I'm sorry I pestered you, then! :) It was pestering with the best of intentions, though! I'm glad you're on top of things! We only have suffered one baby recall (that we know of) and I didn't find out until months later. It bugged and scared me! I don't think stores do enough to help spread the word about recalls. I tried to buy a toy at Walmart a few weeks ago that they wouldn't sell me because it had been recalled, but was still on the shelves! Interesting.. my son only said about 3 words at Odin's age.. and at 18 months was saying about 20. Our ped said he was perfectly normal... I guess maybe he's on the low-end of normal?